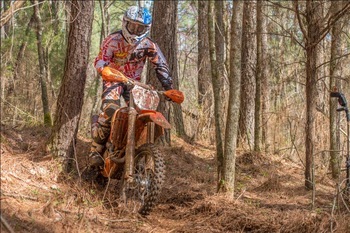 West Point, TN – Factory FMF/KTM rider and the reigning National Enduro Champion, Charlie Mullins, secured his third win in a row to remain undefeated in the Rekluse AMA National Enduro Series. The weather was around 55 degrees with overcast skies for the third round of the series. The hard-packed, red clay terrain was very slick for the riders but the moisture in the air allowed for minimal dust during the six tests. Mullins did not get off to the positive start he hoped for after losing his rear brake a mile into the first test section. He rode the remaining miles without rear brakes and still managed to salvage a 9th place time. His team quickly went to work to repair the brakes before the second test. Mullins times immediately improved and he won the next two test sections. Small crashes on the fourth and fifth test kept him from earning the top time but he still finished in the runner-up spot. With a small lead heading into the final test section, Mullins raced with caution to ensure he did not make a small mistake that would cost him the overall win. He was able to finish with the third fastest time which earned him the overall win for the day and his third consecutive victory of the season. DirtWise/KTM rider Jesse Groemm finished fourth overall for the day, while Mullins teammate, Steward Baylor rounded out the top five. Eight-time National Enduro Champion, Mike Lafferty, was running inside the top five for the first half of the race until a stomach bug caught the best of him and hindered his results for the second half of the day. He was able to salvage a seventh place finish despite his health issues. The final member of the team, Grant Baylor, also had his struggles early on. He had a bad crash in the third test and lost three minutes time while recovering. Although he was able to compete the rest of the day, he had a large deficit to make up and was able to catch back up to 11th position at the end of the final test. Now three rounds into the series, Mullins has a 34 point lead in the championship chase. The riders will now take a break until round 4 which will be held in Park Hills, MO on May 18, 2014.